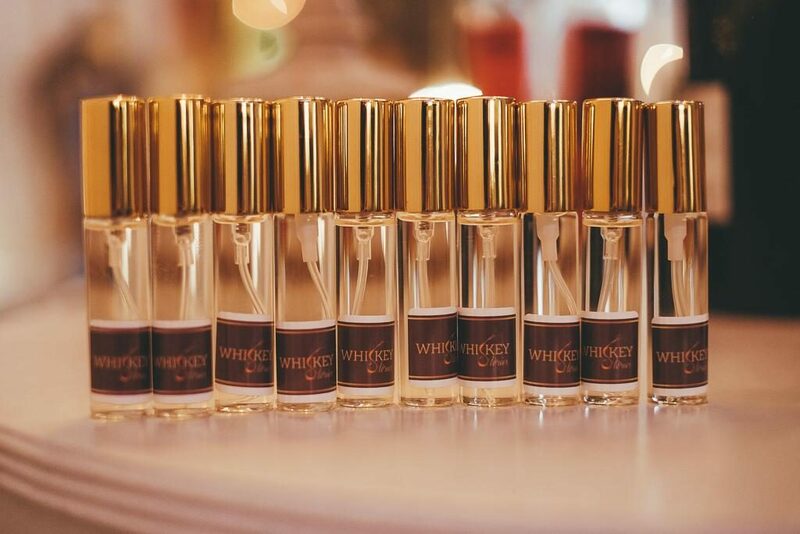 Attention all whiskey enthusiasts, whiskey curious and the like, whiskey-based colognes have arrived in the market. The best part: They’re unisex, so you can buy it for yourself, your friend, your partner, as a matter of fact, you can gift them to your whole family. 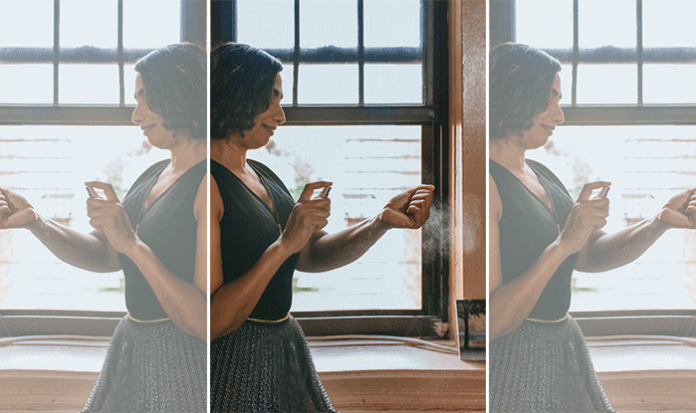 Rachna Hukmani, a whiskey specialist with more than a decade of experience in making whiskeys as well as the owner of Whiskey Stories LLC, a Michelin Guide recommended, luxury multisensory whiskey-tasting company, has been on the path to launching her fragrance line for the past two years. 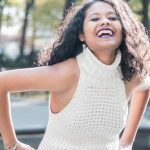 Having realized the base of all perfumes/colognes is grain alcohol, she decided to experiment with using whiskey to craft eight different scents. With all of its unique flavor and aroma, whiskey has “so much to give,” Hukmani says. She felt the “world was missing out” in not experiencing whiskeys as a fragrance. 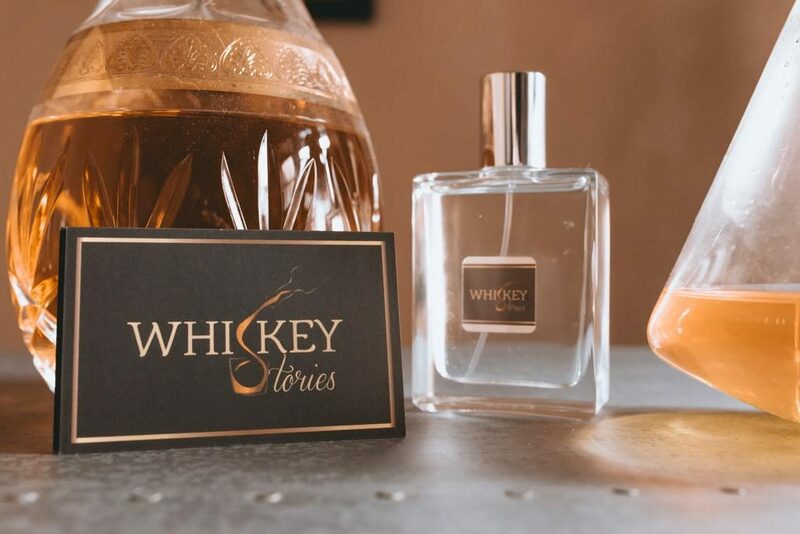 Whiskey Stories’ whiskey-based unisex colognes are infused with essential oils, flowers, fruits, and other natural ingredients which leave you feeling intrigued and coming back for more. Since Hukmani is already experienced in pairing whiskeys with food, a fragrance line was the logical next step. Her background in sensory science and creating her own whiskey infusions and barrel-aged blends lends to her expertise. I wanted to create colognes that stand for something. These colognes are for everyone. Even if you’re not a whiskey drinker, you will find these unique. 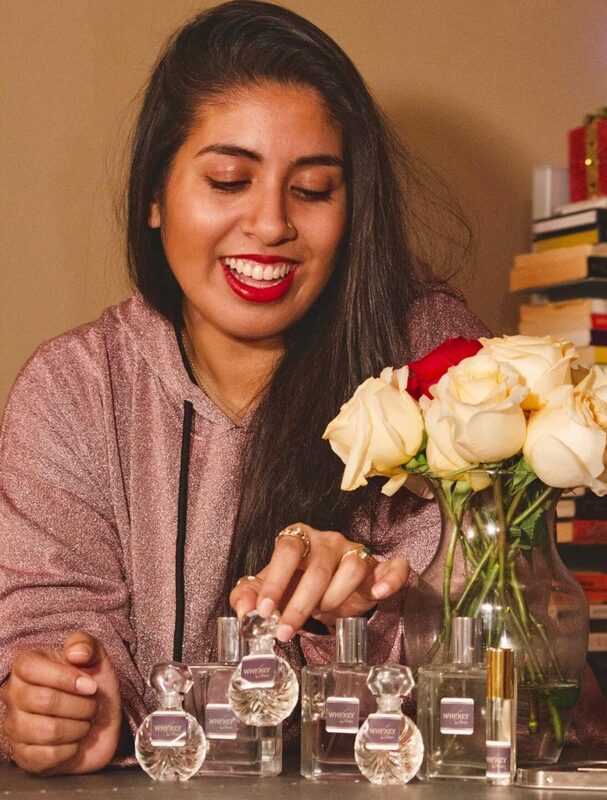 In the process of building the fragrances, she created one with a rye whiskey as a base with grapefruit oils and other ingredients; the grapefruit “took on a personality” she didn’t know it had. Leaving grapefruit on the table until this past summer, Hukmani took on the challenge again getting the proportions just right this time. Several trials later, the eighth cologne, Spring (For New Beginnings) joined the fragrance line and has been receiving positive reviews from customers. 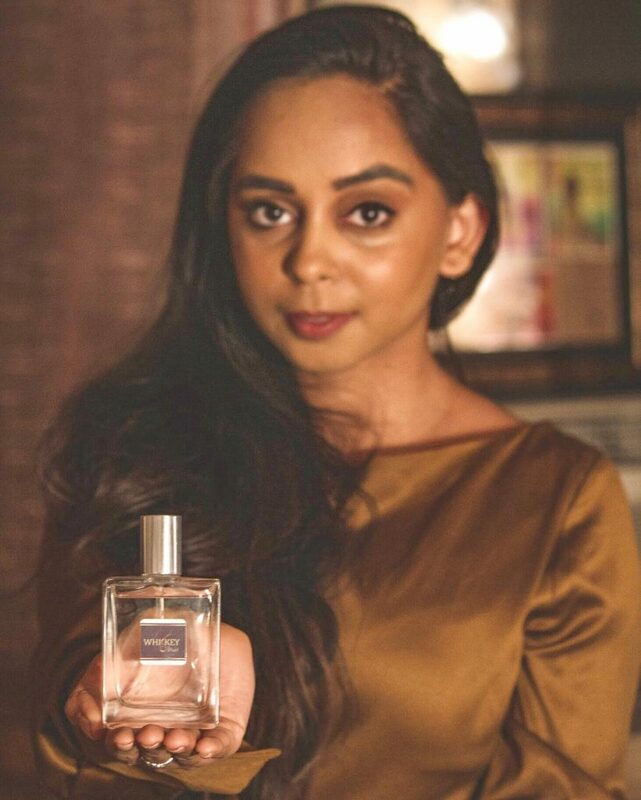 While she loves all her colognes, Hukmani admits that her personal favorite is called Shameless (Be Unapologetically You) inspired by her own late father who would always “call me shameless when I was too much of myself.” With this in mind, she decided to use Peat Monster’s Smoky Blended Scotch to enhance the whiskey’s bold notes. My father never got to try Peat Monster but he would have loved it. Each cologne has its own story meant to evoke a different feeling and offers its own unique personal experience. The following Whiskey Stories proprietary whiskey-based colognes are made with a confidential process and are all available for purchase on Etsy, including an 8-fragrance sampler. You can find all of them here. 1. Shameless. (Be Unapologetically you). With Peat Monster Smoky Scotch as the base, orange peel essential oil and a hint of black pepper, this fragrance is bold and unapologetic, with citrus notes meant to refresh and energize. Put this on and go after whatever your heart desires. 2. Sutra. (Inspired by Kamasutra). 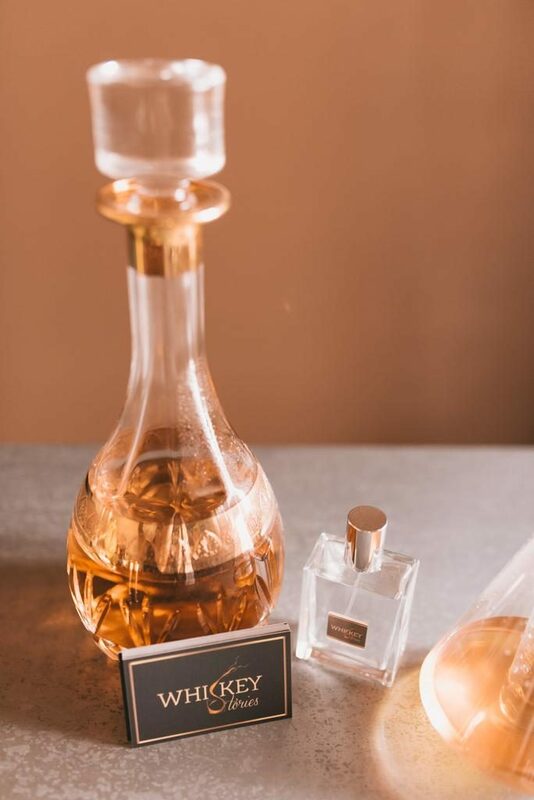 With a base of Jefferson’s Ocean Bourbon which has a natural aroma of roses, this rose oil fragrance generates feelings of openness, warmth, and flirty playfulness. 3. Skyscraper. (Ode to NYC). With Manhattan Moonshine as a base (Manhattan Moonshine is a prohibition style whiskey, rested in oak barrels for an hour) and lavender oil infused with black pepper, this fragrance creates the perfect balance between masculine oaky notes and softer floral notes so you’re ready to take on any adventure. Perfect for NYC living. 4. Shadow. (For your alter ego). Using Suntory Toki Japanese Whiskey as the base with natural scents of honey and ginger and added jasmine oil, chili pepper, and lemon peel, this fragrance is edgy. Try it to discover the many sides of your personality. 5. Soprano. (Honor your voice). Made with Spice Tree Scotch, cardamom, grape-seed, and citrus. Adding another dimension to boldness, this spicy and refreshing citrus-forward fragrance will make you feel alive and sing from the top of your lungs. 6. Shaam. (Add a little mystery). Shaam meaning ‘evening’ in Hindi. Made with Amrut Fusion Indian Whiskey, lemon peel, and a hint of both black and green tea. This fragrance has a different type of smokiness that comes from the infusion of Amrut Fusion and tea. This is perfect to wear on a date or a great evening out celebrating yourself. 7. Summer. (To carry summer in your heart). Made with Hibiki Harmony Japanese Whiskey, lavender infused with a hint of black pepper and orange peel, this fragrance smells like a beach and a sunflower field. Summer is a state of mind. 8. Spring. (For new beginnings). This one is made with Manhattan Moonshine, grapefruit, rose water, and sunflower (pink tinted). This fragrance is the newest in our collection and has taken our range to new heights with notes of new oak, refreshing floral, and fruit along with soft rose oil. Put this one on and pursue a new hobby or take a trip anywhere around the world. Here’s to new beginnings. Check them out and create your own Whiskey Story! Or, give the gift of one.